A quick tour around my website, and you'll notice I'm not a "paleo" person, nor do I usually do paleo recipes, BUT I am a big fan of allergen friendly recipes that everyone can enjoy. 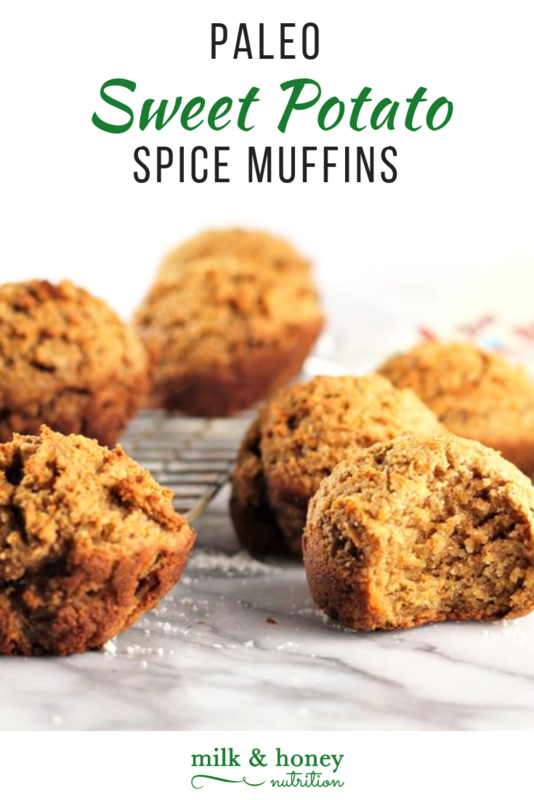 These Paleo Sweet Potato Spice Muffins are also dairy free, grain free, and can be made egg free as well (just use a chia or flax egg). You'll definitely want a batch (or two!) of these on hand year round! This recipe was sponsored by Bob's Red Mill. All ideas and thoughts are my own. Wash and peel the sweet potato. Cut it into cubes, and cook (either boil or steam) until soft. Mash or puree until smooth. Preheat your oven to 350 degrees and grease your muffin tin. Combine all of the wet ingredients including the pureed sweet potato in a mixing bowl. Set aside. Combine all remaining dry ingredients in a large mixing bowl. Add the wet ingredients to the dry ingredients. Using a rubber spatula, mix just until combined. Using an ice cream scoop, drop the batter into the muffin tins making sure you fill and level off the ice cream scoop each time. Bake for 25 minutes until tops start to brown and a knife inserted in the middle comes out clean. Enjoy! We’re all busy. At one point or another, we’re busy. You could be a working mom, trying to get dinner on the table for three kids, or a single person working long hours with no time for meal prep… Whatever scenario it may be, time is a resource most people would love more of. Who doesn’t love a good movie night?! And if the snacks involve bacon, you know I’m in!! This recipe is very easy to make and will have you on your way to the perfect movie night! Nutty Cherry and Bacon Popcorn pretty much says it all, but the crispy salty/sweet combo is sure to please every palate! These Sweet Potato Veggie Breakfast Nachos are a fun savory alternative to traditionally sweet weekend breakfast ideas! Pile on whatever toppings you’d like… everything from onions, to peppers, to bacon, goes amazing on them! These Basic Balsamic Green Beans are the perfect side dish for any meal and they’re super quick to prep: ready in under 20 minutes! You could pair them with your favorite seafood protein, or even some roasted tofu.